← Table Mountain reveals a secret. The Cederberg Mountains are a hiker’s and climber’s paradise, situated just 3 hours drive north of Cape Town. The range is a proclaimed wilderness area full of trails, peaks and perfect crags just waiting to be explored. I recently led a three day trip up there which included hiking, scrambling, sport- and traditional rock climbing. We drove up in the dark, which means the first-timers were treated to the magic of a Cederberg dawn as their first impression of the place. The sight of peaks being lit up by the first rays of sun while you sip your first cuppa is a special wilderness experience. After breakfast it was time to go and play! We headed over to Kromrivier farm to get permits for Truitjieskraal. This area consists of a few acres of rock formations offering plenty of options for climbing. There is a range of quality bolted sport routes from grades 15 to 30, some established trad lines, as well as fun trails and endless rock scrambling opportunities. The rock is classic Cederberg sandstone, very featured and colourful. We spent the morning cranking on the sport routes, enjoying the peace and solitude of the place. We had our lunch in an ancient San cave decorated with paintings. When the roar of the stove stopped, the silence set in and we were transported back to the time when herds of eland roamed the Cederberg. After lunch we decided to switch to trad climbing, which involves placing one’s own protection gear during the climb. It is a more technical and involved style which demands concentration and commitment. 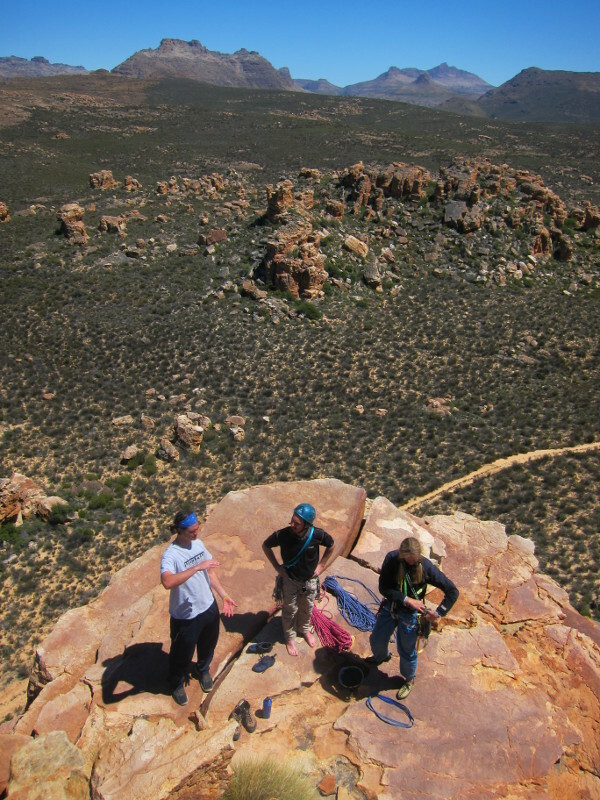 We chose a 3 pitch route called “Slither me Timbers” on the tallest wall in Truitjieskraal. Half way up the wall we found ourselves crowded on a small ledge, shivering in our t-shirts as the sun sank towards the horizon. It was time to make a plan. We set up a secure anchor and abseiled off, vowing to return to retrieve the gear and complete the route. Back at Sanddrif camp it was time for food and wine under the starry Cederberg sky. The next morning was windy and cold, but we packed warm clothes and tea, and headed up to the Wolfberg Cracks. After a steep approach the Narrow Crack Trail follows an ingenious route through tunnels, over chock-stones, and beneath huge arches in the deep canyon. Eventually we got to the top of Wolfberg and headed across to an area of small peaks and jumbled boulders. We dropped our packs and went scrambling! The freedom of movement on rock was fantastic as we found our way up, through, over and down several small peaks. The rain moved in so we returned to our tea-spot for shelter and refreshments. The way down was through the huge Gaper Crack with towering rock walls each side. The third day was a Cederberg classic: blue skies, sunny and warm. It was time to settle the score with “Slither me Timbers”. Back at Truitjieskraal we were able to link the first two pitches, and the top pitch turned out to be superb: great exposure and good moves on solid orange Cederberg rock. Pulling onto the summit platform in the warm sun under a blue-bird sky was a special moment. A deep sense of satisfaction and oneness with nature was the lasting impression. Of course this doesn’t last forever, and soon it will be time to head out again in search of the wilderness experience of the Cederberg. my tailor-made Cederberg experience with Guided-by-Mike was unforgettably marvellous! Fantastic sky, great lead in and some mountains I’d love to climb. Great image. I’m off to the Swiss Alps in a month I’m SO lonkiog forward to it.LensScaper recently posted..